With the Extreme Q Vaporizer, you get more value for your money with it being an all-in-one vaporizer. It’s a complete package that will also work as warmer for your potpourri, oil diffuser and steamer. This multi-functional vaporizer is the product of a well-known Canadian company called Arizer. Although it wasn’t really designed to be a portable vaporizer, it’s still small enough so you can take it with you anywhere as long as there’s an electrical plug. This compact vaporizer uses a 19-volt power adapter. Another good thing is that you can purchase a different adapter for the cigarette lighter in your car. With its ceramic heating technology, it’s a good quality vaporizer that works like charm. It has complete features that you could expect from other high quality vaporizers that includes a remote control for different functions and a digital LCD display that tells you the fan, timer and temperature info. It is versatile enough to use for both whip and balloon inhalation. The unit gives you 3 choices for fan speed. The removable glass can also rotate 360 degrees. This attachment works for the wand whip and the balloon. You won’t have to make any other changes which makes it easy to use. It also has a timer that automatically shuts off. With a midnight chrome finish, it looks clean and smart. The Extreme Q Vaporizer exterior shell is made from stainless steel that doesn’t get too warm to touch. It can heat up from 112 degrees to 500 degrees which is not a range you’ll find with its other competitors. Even with the highest setting, it can still maintain a relatively cool exterior. The rest of the parts are made from good quality glass that Arizer has long been known for. 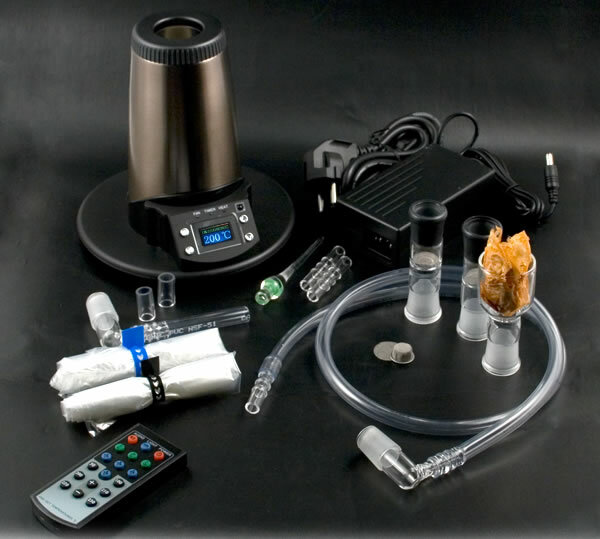 The Extreme Q Vaporizer is durable, performs excellently and has unmatched versatility. Plus, it even has a lifetime warranty. You can get a great deal over at EZVapes.com for the Extreme Q set and free overnight shipping anywhere in the US. They are an authorized seller so your warranty will be good.